PENDENNIS CASTLE was built in 1958 by Harland & Wolff at Belfast with a tonnage 28582grt, a length of 763ft 2in, a beam of 83ft 9in and a service speed of 22.5 knots. She was the largest and the last ship built for Union-Castle as subsequent buildings were ordered by British & Commonwealth. Due to a dockyard strike she was named on the 10th December 1957 but not launched until 24th December. 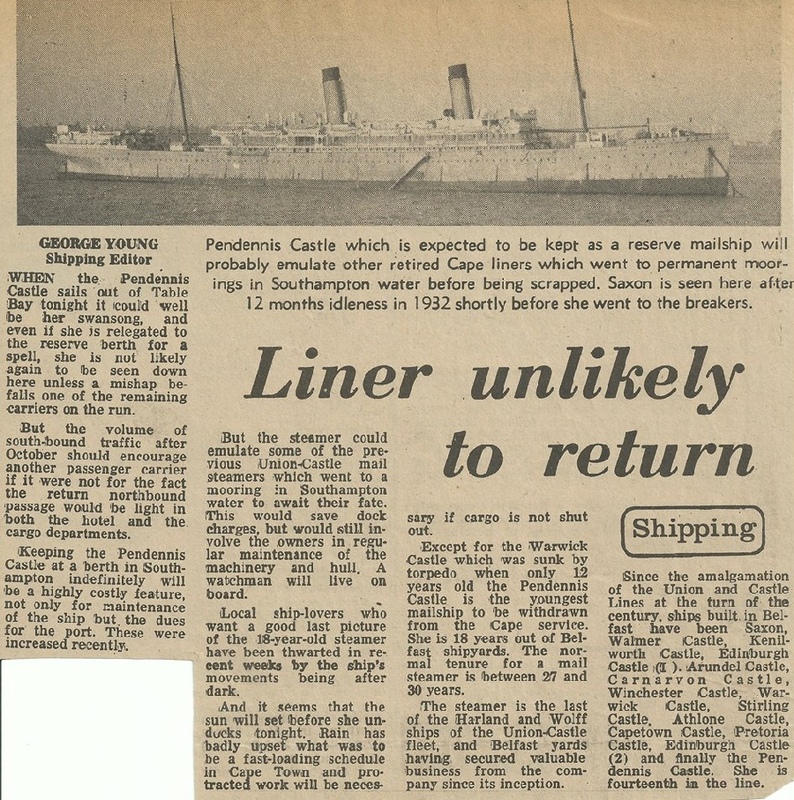 She commenced her maiden voyage on 1st January 1959 on the Southampton- Cape Town-Durban mail run and was the first ship to have Stewardettes - waitresses in the dining room. She was withdrawn from the mail run on 14th June 1976 and replaced by Blue Star's refrigerated cargo liner Andalucia Star but in Union-Castle livery. Sold to Ocean Queen Navigation Copr. of Panama, but Philippine owned, she was renamed Ocean Queen.and arrived in Hong Kong on 9th August 1976 where she was laid up. In 1978, still laid up, she was renamed Sinbad by Kinvarra Bay Shipping Co. of Liberia and later in the year was renamed Sinbad 1. Four years later, in April 1980, she arrived at Kaohsiung in Taiwan for breaking up. 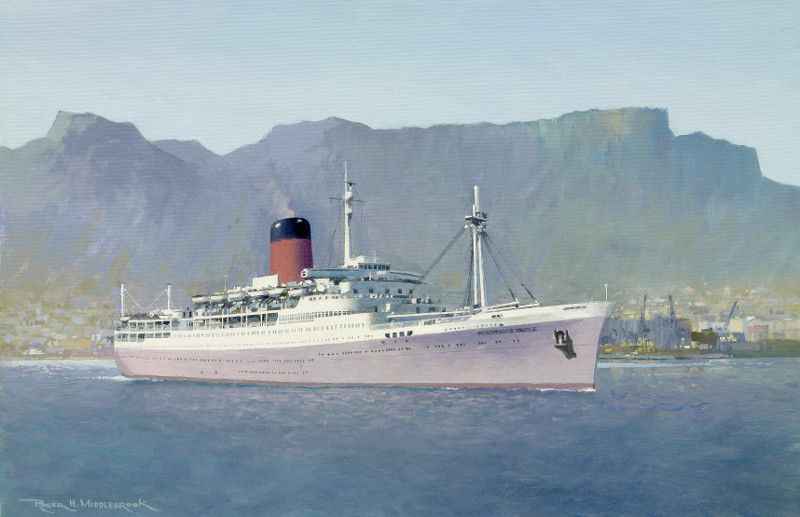 Originally intended as an 'upgraded' "Pretoria Castle", as usual the company was not flush with funds, she was on the stocks when the Cayzer family took over the company. 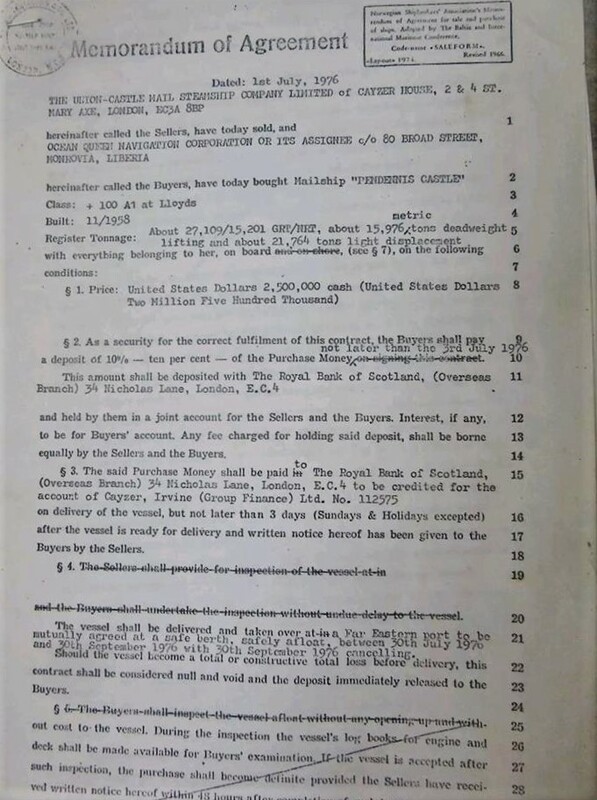 The Cayzer's were a shipping family of the old school, as opposed to the accountancy minded fraternity, they at once saw that the ship as planned would be old fashioned before she was launched. If the company was to compete with Mr. Boeing and his 707, something very much more modern was required. There was nothing they could do about her basic construction, she was far too gone for that, but she could be lengthened to accommodate Denny Brown stabilizers and given a more stylish profile. Whether it was these modifications, or whether it would have happened in any event, I cannot say; the strains of the ship's hull in a seaway were taken up, in the upper decks, with expansion joints, visible as brass covers across the decks. These joints allowed the hull to flex without damage. But the "Pendennis Castle" suffered all her life with cracks in the windows of the accommodation, clear signs that the hull was flexing more than expected. But she was a very popular ship. It was decided to replace the aging 1921 Built *RMS Arundel Castle, thus an order was placed with Harland and Wolff, Belfast to build RMS Pendennis Castle. Her keel was laid in November 1955, just before the Clan/Union Castle merger in January 1956. This merger saw the company going back to the drawing board resulting in a number of changes to her design. She was to become the best mail-ship to be built for Union-Castle and she was the fastest of the fleet, due to the decision by the company to upgrade her machinery. She was also the first mail-ship to have stabilizers, which required a lengthening of the hull from 748 to 764 feet whilst on the stocks. She departed on her maiden voyage on January 1, 1959, under the command of Commodore George Mayhew. Ports of call were as follows: Southampton, Las Palmas, Cape Town, Port Elizabeth, East London, Durban (with occasional calls to Madeira). 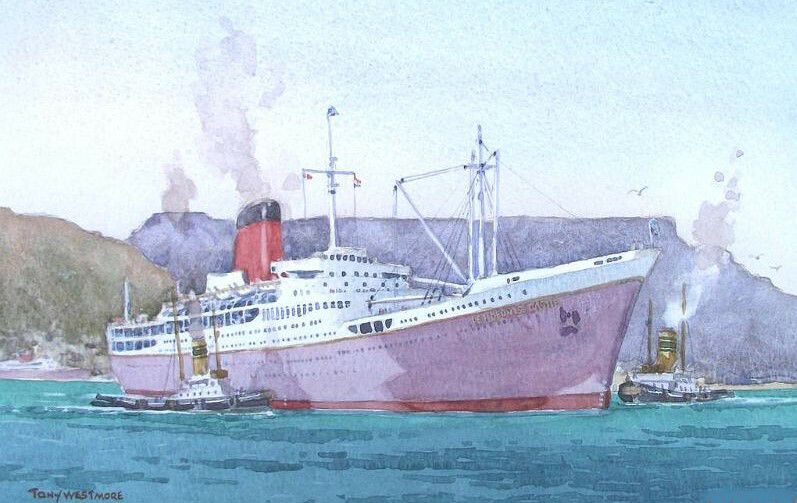 With the introduction in 1961 of the new Union Castle liner RMS Transvaal Castle famed for being the first British liner to carry waitresses, known as “stewardettes” in the dinning rooms, the Pendennis Castle soon also had its own much loved by the passengers - “stewardettes”. Union-Castle Line announced in July 1964 that air-conditioning would be extended to include all first class cabins. In addition a further 21 cabins had showers fitted. She became known as the fun-ship of the Union-Castle fleet, as the company introduced additional amusements and upgraded all recreational facilities, thus, she became a more attractive proposition to younger passengers. 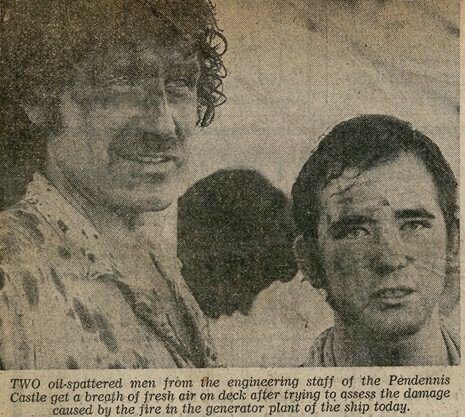 Then in May 1968, whilst berthed in Southampton, a fire broke out, damaging some accommodation amidships, however, she was able to sail on with Harland and Wolff workers onboard who continued to repair the damage. The keel of this vessel had been laid down shortly before the take-over of Union-Castle Line by the Cayzers and she was subsequently lengthened, equipped with technical innovations and given luxurious accommodation by the designer, Jean Monro. 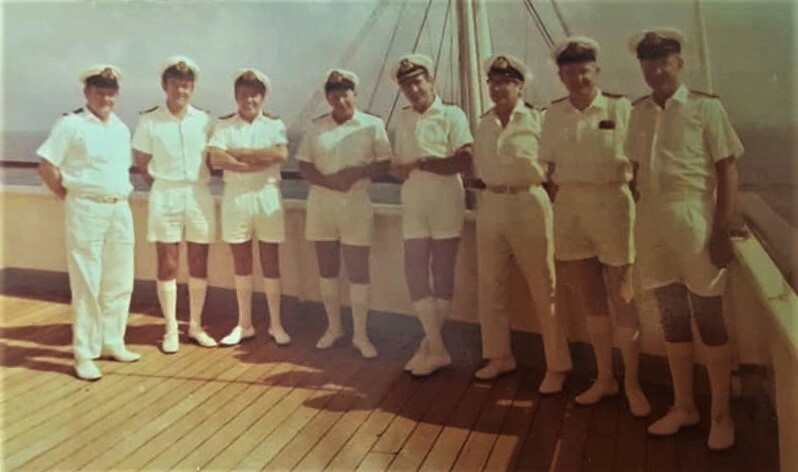 Arthur Jenner (Chief Catering Officer), Jack Eastman (Purser), Arthur Wigham (Staff Commander), Bob Gemmell (Chief Engineer), Capt Stan Catterall (Master), Tony Hodge (Chief Purser), Dr Mike MacNamara (Surgeon), Ralph Hough (Chief Radio Officer). Due to the ever changing conditions, it was decided in 1976 to withdraw her and place her on the market. 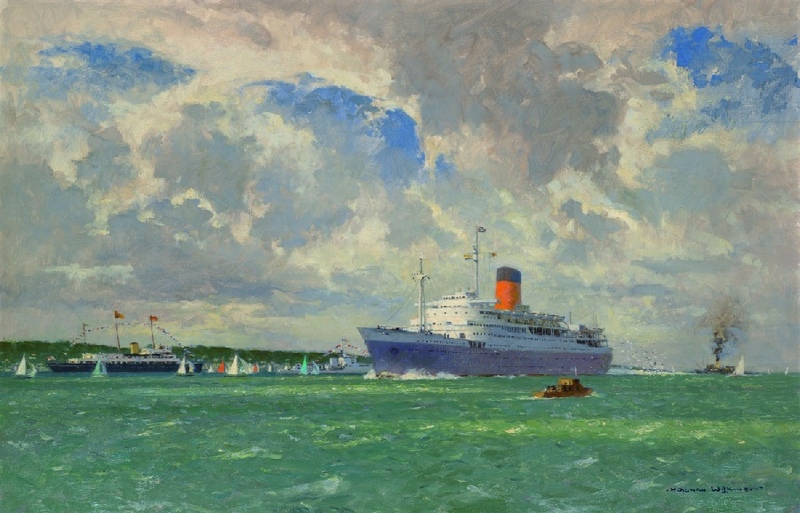 She made her final sailing from Southampton on April 23, 1976, and was withdrawn from the mail run on June 14, 1976. 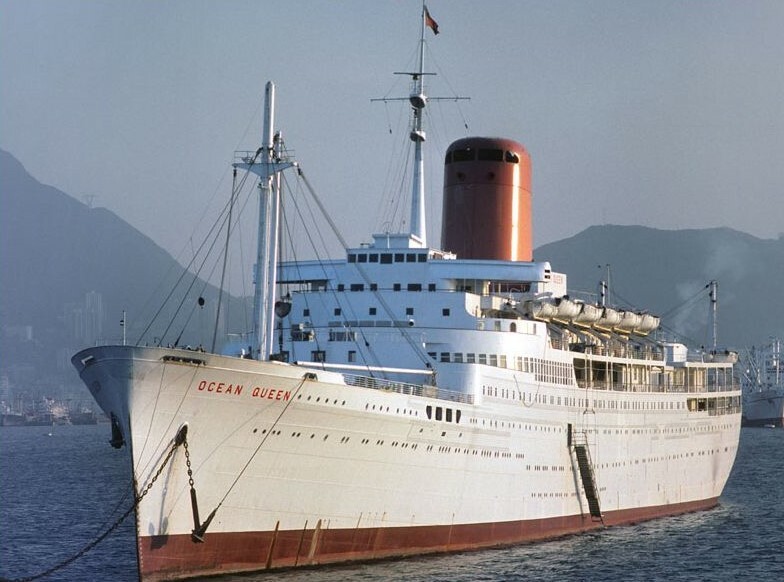 She was sold to Filipino owned “Ocean Queen Navigation Corp.” She departed for Hong Kong on July 7, 1976, arriving on August 9. She was given an attractive new look with a white hull and a gold-brown funnel. The intention was to use her as a cruise ship, but this never eventuated. 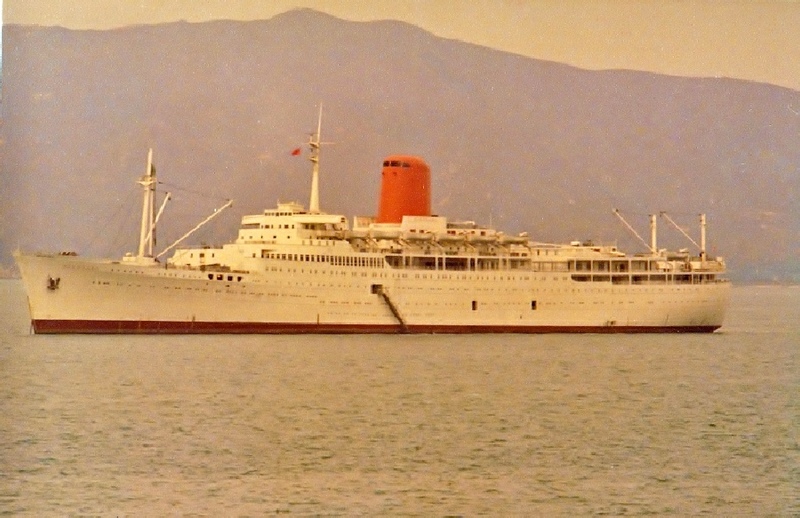 She remained laid up in Hong Kong until 1978, when she sold to a Liberian Company, Kinvarra Bay Shipping who renamed her Sinbad I, but, remained laid up. Having been idle for four years, she departed Hong Kong in April 1980, heading for Kaohsiung, Taiwan where she was scrapped.